PC gaming is a growing industry. People of all ages and backgrounds are finding escape while playing their favorite video games. 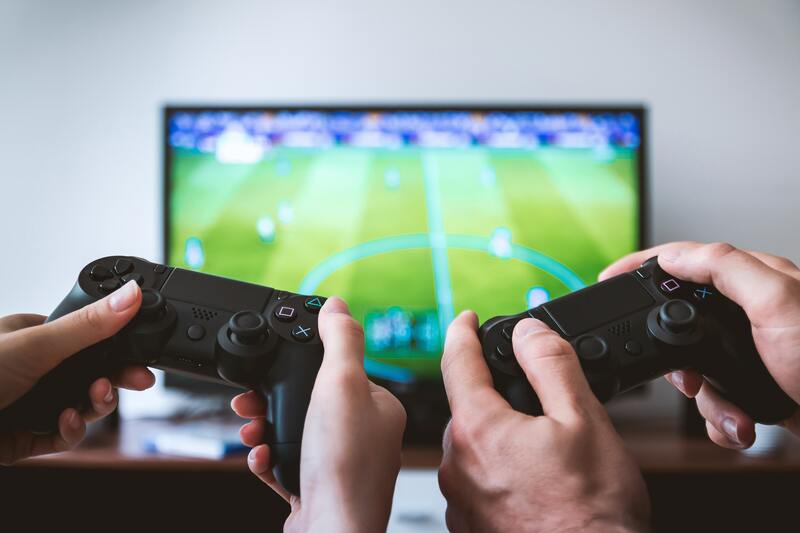 For the most part, when it comes to finding a comfortable chair to sink into for a few hours many of the standard size gaming chairs are flexible enough for the average person. But what about larger people? Fortunately many companies are recognizing the need to provide bigger and more heavy duty gaming chairs for big guys and girls alike. Not only are these chairs designed with greater dimensions but also consider things like the build itself. The materials, structure, and the gas lift are made to accomodate a higher weight capacity while comfortably supporting a wider and taller body frame. Typically lasting longer than a chair that is rated under your weight category due to its design to handle the extra wear that can come from sitting and moving in a seat when repositioning. After some careful research, we have found 5 of the best rated gaming chairs for big and tall people with a variety of prices and specicifc functions that you would normally find on a higher quality gamer chair. Depending on what size you need, each of these gaming chairs have different weight capacities including those from the 300 lb to 400+ lbs. While also having a tall gaming chair range from 5' 9" up to 6'7". 7 Which Extra Large Gaming Chair Is Best For You? Kick back on a more traditional deep-sided `body-hugging' back style chair. Smoothly adjust the tilt angle of your backrest between 85-160 degrees. This means you can sit fully upright, lean back a bit, or lay all the way down and take a quick nap if you want. A combination of comfort and style with its removable headrest pillow and a lumbar cushion, so you can feel comfortable and supported. You can also set the width of the armrests depending on how wide or narrow you are. Assembly is made much easier as the armrests come already attached to the seat. If you order the GT Omega big & tall gaming chair on Amazon, you may be able to recieve free delivery. For more details or to see more reviews, click the link below. Solid foundation: comes with a 5 point aluminium starbase and a high quality ball bearing caster wheels. Tilt locking backrest mechanism: Making it easy to switch between seating positions, allowing you to recline back from 85 to190 degrees. Lumbar support: Curved backrest and seat also comes with a headrest pillow and lumbar cushion for your lower back are included for maximized support. Adjust settings: include a heavy duty height adjustable gas lift and 4D adjustable armrests. Colors: comes in 4 colors including red, black, blue, and white stripe. This heavy duty gaming chair has been rated 5 stars by actual users. If you are looking for a higher weight capacity gaming chair on a budget, Kinsal produces affordable extra large game chairs that are built for taller, wider and or heavier people. Comes with all the standard features you would find in a quality gaming chair like height adjustment and swivel for easier mobility. Although the design of these aesthetically pleasing, you can get a little hot due to the lack of breatheability caused by the pleather material it is covered in. Ergonomically designed for comfort and good posture, these oversized gaming chairs come with both a lumbar cushion and headrest. A couple of issues that stood out for these chairs are the lack of flexibility in the movement of the armrests - if you plan on gaming in this chair for an extended period of time, the tips of your elbows may become a tad sore because there is little cushion to the armrest. The extendable footrest that seems like a good idea but is a bit flimsy. Also the assembling of these chairs seemed problematic for some with the hardware and alignment of certain parts. Not a bad chair for the price but there are nicer chairs out there if you want to spend a bit more money. Higher weight capacity: can hold up to a 280 pound person. Solid construction: made from a tubular steel frame and a star base, providing reliable foundation for someone who is sitting for long periods of time. Easy to clean covering: This chair wrapped in a high quality PU cover in which you can wipe with a rag and is fade resistant. High straight back: which supports the entire length of your spinal column all the way up to the back of your head. Tilt mechanism: the seat can lean back from a 90 degree straight up position to lying all the back to 180 degrees if you wanna take a nap. Chair dimensions: The backrest area = 35" high x 22" wide. As far as where you place your behind which is the seat area the dimensions = 22" wide x 23" deep. Lumbar support: This chair also includes a headrest and lumbar pillow. 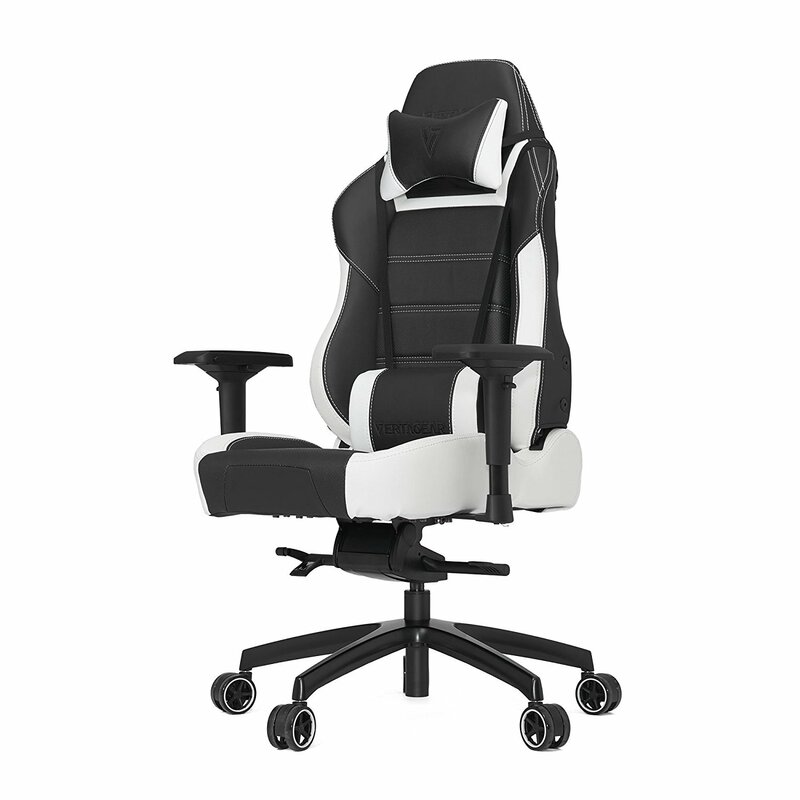 This heavy duty gaming chair has been rated 3.6 stars by actual users. All the luxury and comfort that goes into every DX racer has been put into this XL size gaming office chair. Why not own a brand name chair that is highly credible? 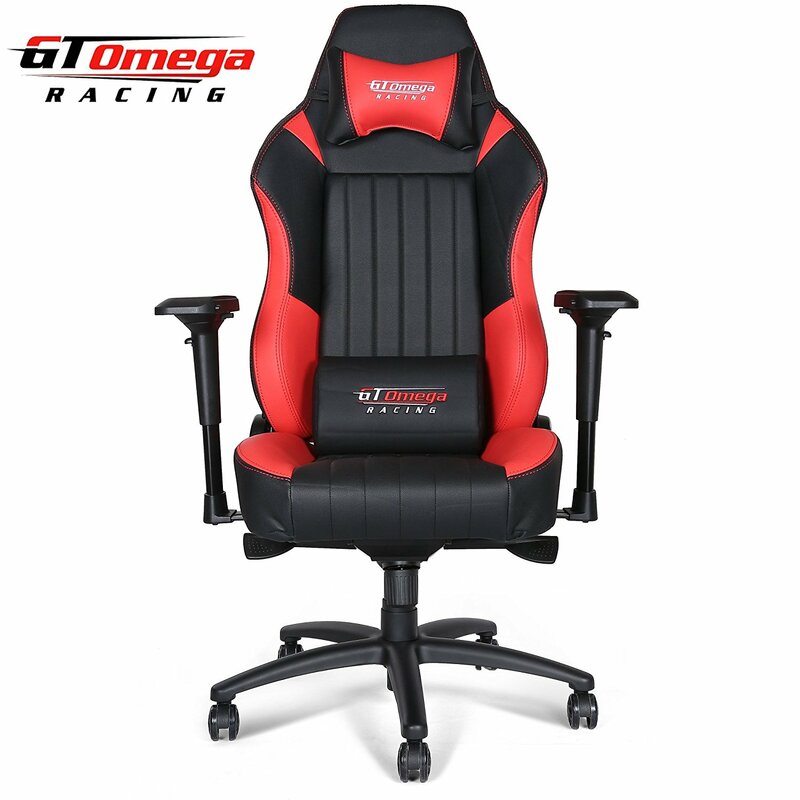 DX Racers are one of the most well known and used gaming chairs in the world. Usually cheaper models of gaming office chairs can only make economized versions of these high quality extra large PC gaming chairs. Comfortably supports someone who is up to 6'6" in height and weighing up to 450 pounds. Making such a claim comes with having the confidence that these chairs are well built to be comfortable and long lasting knowing that both the design and materials are top grade and able to handle taller and larger sized people. These chairs are highly functional in order to make your sitting experience as personal as you like. Depending on your size and most comfortable seating positions, these chairs are able to make adjustments in height, width, and seated angle. Keep in mind that when you first purchase the chair, it will arrive from the factory stiff and a bit uncomfortable. Once the chair has time to warm and is broken in you should notice a difference. Heavy duty weight capacity: can hold up to a 450 lb or 204 kg person. Solid construction: It is manufactered with a tubular steel frame and a high grade star base, and engineered to be extremely sturdy. A person with larger proportions will appreciate the level of stability and balance this heavy duty gaming chair offers. Easy to Assemble: Although there seems to be more parts to a DX Racer compared to a construction of a lesser model. But the advantage comes with the well organized packaging , the fact that the machine holes match perfectly. Not to mention that construction is also made simple from the easy to follow instructions. Heavy duty - T tilt mechanism: You can both recline and tilt in this chair. Lock the backrest into a variety of positions from a standard upright position to lying on your back. Extra wide sitting space: From the inside of the headrest measured out to the edge of the seat gives you approximately 25 inches or 63.5 cm. Combined with approximately 26 inches or 66 cm of width between each armrest. Chair dimensions: 32 x 26 x 50 inches or 81 x 66 x 127 centimeters. Solid base & wheels: comes a 5 point aluminium base and 3 inch wheels that glide seamlessly over most hard surfaces. This is a great option for someone who needs a chair that can easily suspend a person in the 400+ pound range. This particular heavy duty game chair has a maximum 440 lb or just uner 200 kilograms. A solid and comfortable fit for those who seek an extra large gaming chair. Made of industrial-strength heavy-duty metal that can handle heavier loads for long periods of time . Its base frame is produced with a reinforced heavy-duty aluminum alloy material that provides stability and longevity even when used with a higher frequency. 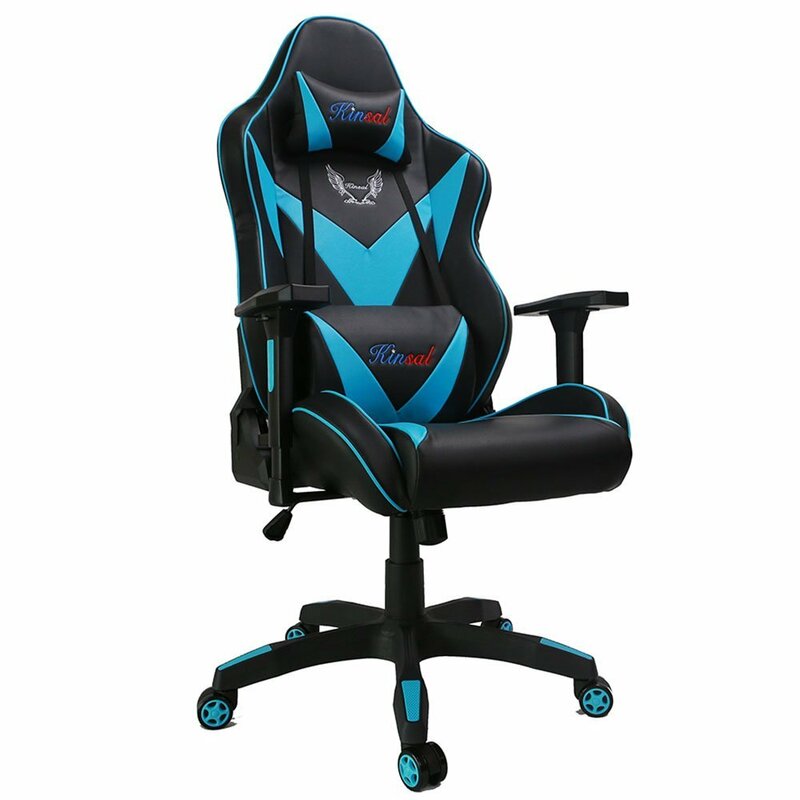 Vertegear gaming chairs are very popular amoung gaming professional teams including eSports Club, WorldBestGaming, PandaGlobal, and many other events and gaming venues including some college gaming groups like SBUeSports and UCI. Rated for high weight capacity: can hold up to a 440 lb or 200 kg person. Highly adjustable functions: Set up your gaming chair the way you most feel comfortable by using its variuos functions including tilt, fully adjustable armrests, seat height settings, and more. Easy to Assemble: These chairs only require one person to construct in an easy 12 step process shown in the video below with its "slide-in" design. Full tilt function. With a pull of the paddle located under the left side of the chair and lock the seat to different tilted positions from 80 gegrees to 140 degrees. It also comes with a kilt tensioner but you can slide out and seats resistance as you lean back. Color patterns. 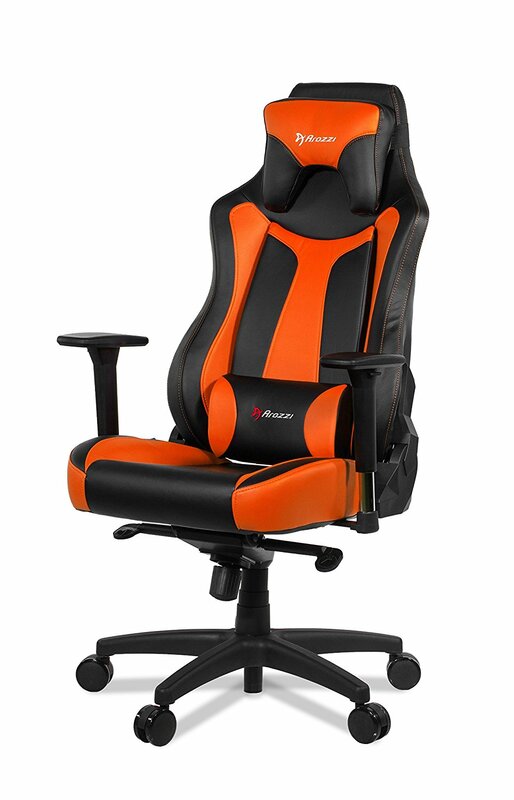 These oversized gaming chairs come in eight different colors including black/orange, black/green, black/blue, black/red, black/camouflage, black/carbon, and blac/ white. Perforated PVC leather: The chair is covered in a high quality, durable material that is meticulously perforated in order to allow body heat to exhaust more efficiently, keeping you cooler when stationed in the chair for long durations. Cushioning: You will enjoy both firm support and comfort from the ultra premium HR(High Density) 4lbs/sq ft resilience foam and pillow accessories. Extra wide and tall sitting space: Being 25 inches wide and deep give a larger person plenty of room without being squished between the seat edges or armrests. Recommeded for those at a Height between 5'9" - 6'11. Chair weight & dimensions: This chair weighs 57 pounds (26 kg) and is 25 x 25 x 55 inches or 63.5 x 63.5 x 139.5 cm. Solid base & wheels: comes a 5 point aluminium base and custom 3" / 75mm racing stylist caster coated with PU for soft and smooth gliding on any surface. Arozzi's team have done it again with their high capacity gaming chair inspired by Swedish design who lead the world through their innovations in modern furniture arhcitecture like that of IKEA. Their tall gaming chairs with heavy duty features are backed by their claim to provide what they like to call "productivity enhancing items for gamers". Whatever is going to maximize your gameplay while helping you stay comfortable, when it comes to things like gaming desks, eye wear, and of course PC gaming chairs Arozzi leads the way. The same high quality materials and layout, and craftsmenship also goes into the construction of these specialized chairs for bigger and heavier gamers or those who like prefer these chair for their office. When you lean all the way back in the chair you might feel like you are going to topple over, but you soon realize how stable it is. Keep in mind that this chair was built for taller people, so if you are under 5'11' your feet may not reach the floor. One unfortunate thing about theses chairs are that the wheels that come standard on each model are a solid black unlike many of the competitors using racing stripe wheels with different colors. Also the width is good but its depth is a bit less than some of its competitiors. Made for larger than the average body type. Lean back in its extra high seatback and wider chair that smoothly glides on its premium casters. This oversized gaming chair hs been rated 3.9 stars out of 5.0 for overall quality and performance. Order through the link below and see of you qualify for free shipping in your area. Rated for medium heavy weight capacity: can hold up to a 360 lb or 163 kg person. Rocking function: This chair can be tilted up to 12 degrees in any position. Also comes with an adjustment wheel to set your desired resisitance. Assembly: As far as instructions and the build layout, it is fairly easy to follow. However, this chair is heavy and may require 2 people to assemble. Adjustable settings: A fully functional oversize chair with armrests are adjustable in the three dimensions, up, down, left, right and front and back, and both chair tilt and recline are lockable with preset positions. Color options. 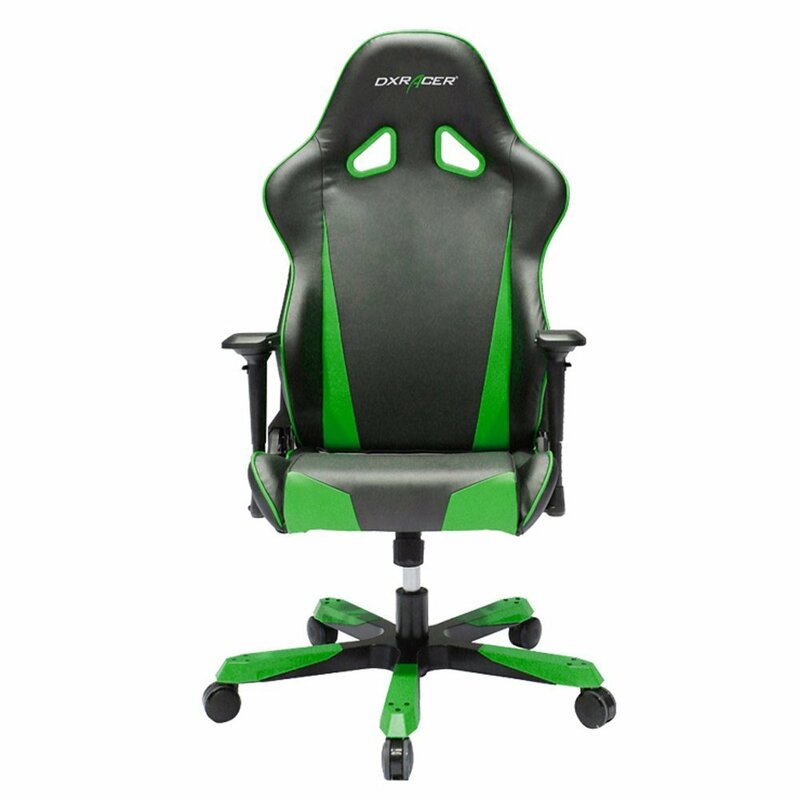 These larger PC gaming chairs come in six different beautiful designs and colors including black, blue, red, green, pale green, white, and orange. Covering & cushioning: The chair is wrapped in a high quality, durable soft and luxurious pleather upholstery. Cold-molded foam cushioning for the ultimate in comfort and durability. Seat height adjustment: By the pull of a lever you can quickly go up or down and lock in your desired seating position. Unique to this chair is that the seat is attached to the lift in a yoke that suspends the set horizontially providing balance and stability. Chair weight & dimensions: This chair weighs 50 pounds (22.5 kg) and is 20 x 13 x 57 inches or 51 x 33 x 145 cm. Ergonomically designed: comes with a high seat back and extra-large sculpted head pillow for maximum comfort and neck support. This heavy duty gaming chair has been rated 4.1 stars by actual users. Which Extra Large Gaming Chair Is Best For You? Choosing the right chair for gaming will greatly depend on your specific needs involving your weight and bodily dimensions. Price may also be a factor. Just keep in mind that the wear and pressure that a heavier weight can place on a chair will play a large factor in how long the parts will last and how well the chair can comfortably support you. Other features can also be as important like the fuctionality and movement of the chair giving you the freedom to set up and change your seating position with ease. In most cases it is worth it to spend a few extra dollars on a higher quality chair that is well within the range of your weight, height and shape. If you need a larger capacity office chair and you don't necessarily need a gaming chair, be sure to check out our page on big & tall office chairs.